The podium of the third race on the Hungarian circuit has been a remake of the podiums of last year's Formula Abarth. Sirotkin triumphed ahead of Patric Niederhauser and Robert Visoiu. 06/05/2012 - Another podium on the sign of Formula Abarth in the first season of the Italian Formula 3 European Series. 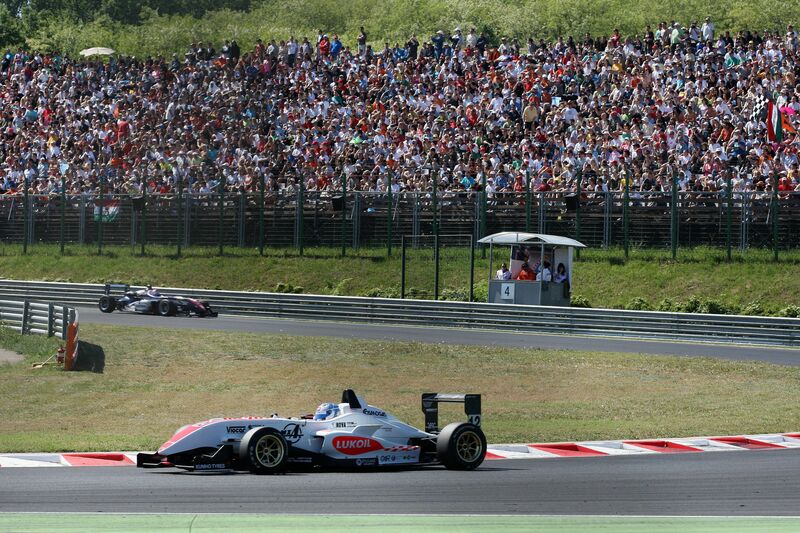 After the victory of Patric Niederhauser in Valencia, ahead of Sirotkin and Barrabeig, the third race of the Hungaroring saw the Russian of Euronova victorious ahead of the Swiss Patric Niederhauser (BVM) and the Romanian Robert Visoiu (Ghinzani) in front of 40 thousand fans. Interestingly, the three drivers on the podium where all racing for Jenzer Motorsport at the beginning of the past Formula Abarth season. Sergey Sirotkin is one of the youngest drivers to win in Formula 3, just for a matter of days he did not manage to better Raffaele Marciello's record, as the latter won last year at sixteen years and six months of age. In race 3 the Russian of Euronova had a good start ahead of Niederhause and managed to get a good margin on the Swiss. Behind them, at the start, Mario Marasca (BVM) forced Visoiu towards the wall but at turn one he locked up and allowed Nicholas Latifi (BVM) to get through after a good start from the seventh position. The Canadian driving for the team led by Giuseppe Mazotti led a good race on times close to those of the leading pair and held the third position until when two laps were left when the Rumenian of team Ghinzani, Robert Visoius, got past him in a spectacular maneuver. Latifi had to content himself of the fourth place ahead of the French of Prema Powerteam, Brandon Maisano. The sixth position was obtained by Mario Marasca (BVM) who was followed by Henrique Martins (Prema Powerteam). Race two's winner ended only eighth, as Riccardo Agostini managed to keep behind Gerard Barrabeig (Ghinzani), Eddie Cheever (Prema Powerteam) and Yoshitaka Kuroda (Euronova). The new classification of the championship sees Eddie Cheever on top with 72 points, leading his team mate Henrique Martins at 64. JD Motorsport's Riccardo Agostini is currently in third position, as thanks to the victory in race 2 and to the second place in race one he reached 57 points, that is five more than the French of FDA, Brandon Maisano. The next round of the Italian Formula 3 European Series is scheduled for the weekend of 10 June at Mugello, where the Italian Formula 3 Championship will start as well.